My girlfriend, our fathers and I wanted to express how fantastic our weekend was staying at your camp on father's day weekend! It wasn't as sunny as we would have liked it but hey, we aren't made of sugar and can have some fun in the rain too haha! You, your family and staff were very courteous, helpful, and let us know where to find and how to catch the right fish for our day on the boat. I believe we had caught close to 20 fish between the four of us, and I think I was the only one to catch smallmouth bass. BTW bass are my favorite fish to catch for the fight alone, which was thrown back obviously. My girlfriend's dad caught the biggest Jack-Fish (Pike / Northern), and my dad caught our only two Perch (his favorite to catch). Your camp was kept well, the cabins were well maintained, and the overall atmosphere was very relaxing. I also wanted to thank your (I believe he was your son) for teaching me how to properly fillet a fish. Reading books or watching youtube just isn't the same as having someone show you the do's and don'ts. With the weekend of memories put behind us and pictures saved to our computers, this is one weekend I will never forget! 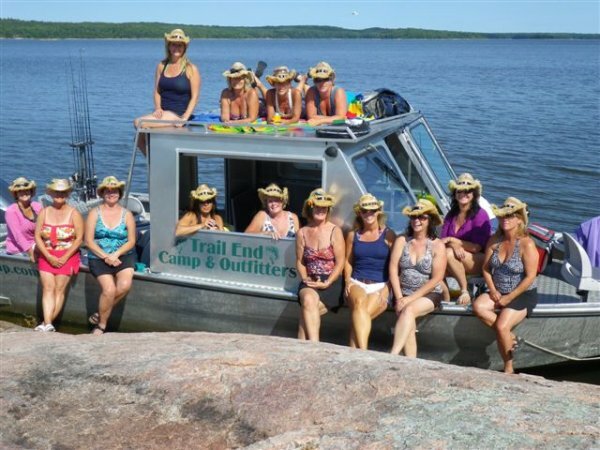 Looking back at this weekend I would recommend your camp to anyone who loves the taste of the open lake, and the thrill of a great fishing experience! On behalf of my family, I want to thank you both and your staff for a wonderful week. Your hospitality and the environment you have established at Trail End Camp is world class and was a relaxing week of hunting and fishing for all my family. All three of my children expressed that this was one of the best vacations taken and they enjoyed the activities as well as the food and friendship. Natalie really enjoyed Jeff’s fishing guidance and has fallen in love with fishing. Spencer’s patience paid off on his bear hunting experience and after 3 days of waiting for the right bear, his took a 6-foot 3-inch bear. Not as big as Dad’s bear, as he was hoping, but still a very rewarding experience. The weather was great for our week and the river was beautiful and even with the water still being very cold the fish were active and we had a blast catching fish. Spencer took the prize with 16 caught on his best day. I really enjoy the vacation and must say the 6-foot 9-inch bear that I shot surpassed my expectations and it will make a beautiful rug, which will remind me of the wonderful week we shared with your family and staff. I am sending pictures of the 35-inch Northern Pike I caught on Tuesday while we were fishing with Jay. We had an incredible time, and Jay was an awesome guide and shore lunch cook. Thanks for a great couple days of fishing. Alex and I really enjoyed our stay. The day you spent guiding with us was one of the best days of fishing we've had. Friday, we caught an additional 21 Northerns and a nice sized Walleye. We're going to plan on returning next August. We'd also like to travel to Churchill while we are there to see the Belugas and Polar Bears. If you would send me any contacts or information that have about Churchill, I would appreciate it. Cheers. See you soon. J.P.
Just thought I'd email you this picture of a pike my dad caught. Thanks again for yet another great year out at the camp. Memories that will last a lifetime. I must state my total appreciation and gratitude for your hospitality and professionalism and especially for assisting me due to my health situation. You both should be very proud and satisfied with your operation as it is a class one and above facility with some great people assisting. The hunting was very good, the shore lunches were excellent, the facilities were above and beyond normal from my experiences and the meals were excellent. One could not expect anything any finer. I definitely will recommend your facility to anyone who is interested. If I get back to feeling normal, I would like to re-visit for another great experience. Thank you so much for a great week! The boys and I had a great time and shared many memories. You have a great camp and a wonderful staff. The food and accommodations were excellent and the fishing was great. The bear stands were closer to the bait than I needed but certainly added to the excitement of the hunt. We had a wonderful time last week. The lodging was very good, the food was excellent thanks to your wife. The guides were very good and always wanting to help in way possible. As a guy that has some physical problems I was somewhat fearful of coming on this bear hunt but once I got there I was pleasantly surprised. All the guides were so helpful. Tyler was also great to be around and always willing to do anything to make our stay enjoyable. The frosting on the cake was the excellent bear hunting. I got the bear of a lifetime and man, was I excited. All five other guys tagged out as well and were very impressed with your operation. God willing we will be back for more bear hunting and fishing next year. Have a safe and enjoyable winter and stay in touch. In addition, you have some great kids, Carter and Kaley. Once again thank you for the excellent hunting and fishing trip again this year. You are great people and have a top notch operation. We feel lucky to be invited to come up and enjoy your place. Just wanted to let you know that everyone had one of best times we ever had. My cousins said this was a world-class adventure, one they will always remember and the way you looked after everyone. The shore lunch was great, the whole day was great, even though I didn't catch any fish, It made my day to see everyone having such a good time and being together with my son made it even more special. It was great to see and talk to your mom and dad, they look fantastic as always. We are planning for next year already, maybe a two or three-day trip????? and more cousins. thanks again for giving us a day to remember, you my friend and Trail End Camp are truly #1. Well, I’m sitting here thinking about the wonderful time I had there. Maureen the food was the greatest and thanks so much for looking after the cabin each day for us, I know you have a full plate each and every day. Vance is a lucky man, and with all that you still find time to be a good Mom. It was fun to teach Carter the Crossbow, he’s a good kid. I felt like I was at a family function, instead of a hunting lodge, it was wonderful. Vance thanks for all your knowledge, we had a fantastic fishing and hunting trip. The scenery was second to none, a lot of beauty and pride goes into your camp. You, George, Stan and Big Carter showed us a great time in whatever we did. I highly recommend to anyone Trail End Camp, as there is no better place to go for Bear Hunting and Fishing. I was at the camp September 2012 and had the best time of my life! Vance feel free to give my number out should anyone wish a further recommendation. Thank you so much for hosting the "best ever" family reunion. The Monday evening gathering of the clan in your beautiful lodge was awesome. Wednesday morning fishing trip was a huge success by the comments I heard. The fish fry & potato fries scrumptious! I thank you for all the thought and hard work you both put into our get together. A good time was had by all my family and I'm sure everyone else. Just a note to say thank you to both of you for your hospitality on my visit to Trail End Camp on Thursday last week. My Dad, George Feschuk has been fishing at Pointe De Bois for the past 60 or 65 years. I have been with him since I was 5 years old so it has to be at least 63 years.!!! He turned 100 in January, broke his hip for a second time in February and has been practicing walking ever since in the hope of getting to TEC at least once this year. He usually goes to bed at 6:30 - 7:30, but on the evening of our trip I finally had to chase him to bed after midnight...as he was working on his fishing rods and tackle box!!! He then woke at 4:30 to be ready for our 9:30 departure. Maureen, you were fantastic for your hospitality and help, getting the boat ready and Vance's cousins to help Dad get down to the dock! The boat was exceptional, with its high sides and carpeted bottom and seats. He even managed to get out of the boat himself. Although we did not catch anything and did have a little rain our memory of that afternoon will last forever, and my Dad still is talking about getting out again! He was disappointed that Vance was not there or his parents, but is sure he will see them all on his next trip. Just wanted to drop a note to say thanks again for a great time in Manitoba. Between seeing the three cubs and taking my first bear it was all very exciting. And, between my bear meat and Ed's, I am rich with bear meat (I've already set aside some to share with some coworkers who really wanted to try it). I meant to respond much earlier .. to thank you guys for the great week of hunting and fishing.... (just been too busy I guess) Chris, Ray and I sure enjoyed our stay with you. I particularly loved the wonderful meals served by your staff at the lodge. Each and every meal was excellently prepared and the service was wonderful. We absolutely enjoyed the fantastic day Saturday heading up north to fish northerns, and I still can taste the great shore lunch you cooked up for us Vance!! Again thanks to all of you... the girls in the kitchen, Kevin and Paul... (and the official 'stand-in-grandson> Carter, who came up to me and hugged me on bringing my bear in), Maureen (my wife loved her red 'bear' jacket) and the Northern lights were fantastic also, and Vance : "... thanks for the expertise provided to make our camp so meaningful. Just a little note to say hi and to let you know how much I enjoyed the hunt, the accommodations, and the company of your beautiful family. I just can't say enough how much I am looking forward to next years hunt. Hope this mail finds you and your family well and happy. Have a great Holiday Season!! Just a note to thank you very much for the great food, great hospitality, and great hunt you both provided last week. I really enjoyed myself. Please also thank George, Derrick, Leanne, and Yolanda for their assistance. You have a truly good staff working with you. I will certainly pass on the information regarding your outfitting and professionalism. Thank you again. Good hunting. None of us have ever had an opportunity to be on a hunt as you provided. We have all shot geese, but never in the quantity or quality in which you had provided. We will all be back up real soon. You run a first class operation with great staff and pay attention to the details that make sure your hunts are the best possible. Maureen was a saint with her home cooking and 150% positive attitude. You both made us feel like family and very welcomed. Just wanted to send to you many thanks on an awesome week of hunting and fishing. This was my first bear hunt and how exciting it was. Vance, Maureen, Mickey, Mark, Stan, Ron, all of you were great and exceeded my expectations on your hospitality and making sure our week was memorable. Your accommodations are the nicest I have stayed in while on a hunt, and hats off to the cooks, both in the kitchen and with the shore lunches. The numbers and quality of bears were outstanding. Words can’t describe that initial sighting of the first bear that came into the baits. To all of the guides your genuine interest in making sure our hunt was successful and all of your help in setting up the baits, recovering the bears, and preparing our bears to bring home is also greatly appreciated. The fishing was an added bonus that will leave many fond memories as well. I have already talked to several of my hunting buddies and shared both stories and pictures and I am sure I will return with new guests so that they too can experience such a great trip. I will not hesitate to recommend your camp to anyone who wishes to have a wonderful hunting and fishing adventure. Thanks again, and will see you in the future. One of the reasons I enjoy hunting is for the adventure and travel. There may be no better way to go to new places and meet interesting people. Yet, I often find myself going to the same places since I have had such great experiences, and every time is different. My first bear hunt was in 2009. There were eight hunters in camp that week at Trail End Camp in Pointe du Bois, Manitoba, Canada. For most of us, it was our first bear hunt. A cold front came through which was much stronger than expected and that slowed down bear movement considerably. None of us were completely prepared for the unexpected low temperatures and we all traded gear so everyone could get through. We saw a good number of bears and every one of us had opportunities to take a bear, with seven out of eight of us going home with one. 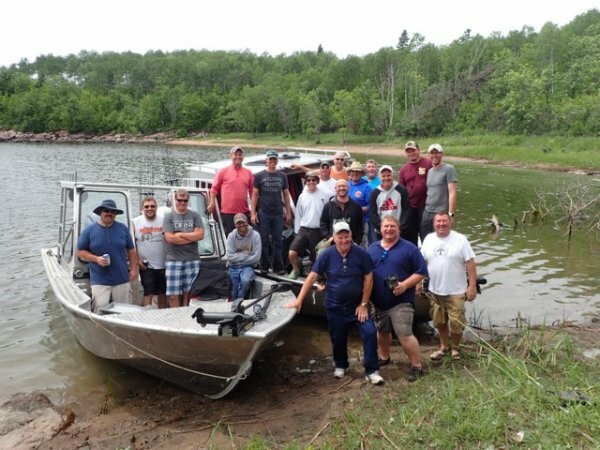 We all also enjoyed the outstanding fishing that was available on the Winnipeg River. My first bear that year was a sow on the smaller side, but I was more than thrilled. Anybody who thinks hunting bears from a stand over bait is boring has never taken the time to sit back with closed eyes and enjoy the quiet contemplative moments in the woods that are all too rare in modern life, or kept their eyes open to watch pine martins, beavers, squirrels, ruffed grouse, and fishers run through the forest. I had a sow and three cubs come in one evening which still ranks as one of the most entertaining evenings of hunting I ever had, despite never taking the safety off. Vance and Maureen Hrechkosy run a top notch operation in the Whiteshell Provincial Park. They employ guides who are true sportsman and love the outdoors. I returned in 2011 to again hunt bears. The economy was still struggling in 2011 and that was felt north of the border as there were only three of us in camp that week which made the hunt feel completely different than 2009. I saw many bears in 2011 including a few brutes. I ended up taking a bigger bear than in 2011, but it was not even close to the biggest bear I saw. This wasn’t a case of ground shrinkage after the shot. When my 2011 bear came out, part of my brain knew it wasn’t the biggest bear in the woods, but some other part of my brain just assumed that should be when I should see a big bear. Much like my first bear hunt two years previous, I was thrilled. The coat on this boar was deep black, thick and luxurious. I had a perfect spot picked out for the rug before returning home. 2014 brought me once again to the Manitoba wilderness. There were five of us hunting bears and two along for the fishing, including my friend Dennis, an avid fisherman. The hunting started out a little slow, but a few days in things changed quickly, as they can while hunting. The first bear came out early in the afternoon. I could tell it was a very good bear immediately but held off since it was so early. I looked at the bear and thought back to my first bear in 2009. Like that bear, this bear had the tapered head and the uncanny ability to quietly walk, seemingly above the forest floor. No, this was a sow and was not the bear to take. After quite some time in front of me, she crouched down like a worried dog, looked in the direction she came from and bolted out of the area, running almost underneath me. The second bear came in immediately after this. He walked boldly in after smelling the area. He was shorter than the first bear but much bulkier. I thought back to my 2011 hunt and this bear had the same blocky head and confident demeanor. The part of my brain that told me to shoot in 2011 was overridden by another part, telling me it was early. This was not my bear either. I had several hours to rethink my decision not to take that second bear as thunderstorms began to build. It got later and the sky grew darker, a foreboding that made me glad for waterproof hunting gear. A third bear entered the clearing. This was a different bruin. He towered over the first two I had seen. Even sitting there with a firearm, it felt somewhat intimidating being so close to such an immense bear. It felt like he was looking right through me, and didn’t seem as interested in the bait as the lingering scent of the first two bears. The bear bolted at the shot and the skies unleashed a torrent of water as the thunderstorm passed over. With the rain having washed away any potential of a blood trail, I looked for my bear in the remaining daylight. After a few false starts and a warning in the form of a guttural woof-woof from another bear in the area, I found him only a short distance from the clearing. My shot had been about as good as possible under field conditions. I looked at my third bear, his thick black hide and huge paws, and waited to meet my guides for the difficult task of getting the animal out of the rough Manitoba brush. I briefly thought that I had just proved the adage: The Third Time’s a Charm. But this is wrong. My first bear hunt was my first bear hunt, meeting a great group of guys and I wouldn’t trade that experience for anything. My second bear hunt allowed me to see many more bears and take a boar while experiencing some of the best fishing of my life. This third hunt had me again hunting with a great group of people, sharing the experiences and making new friends. And I had just taken a truly remarkable bear. The third time may be a charm for some, but I’m three times charmed.